St Gabriel’s today is enduring testimony to the foresight of the Victorians who planted a church in the then newly-developed suburb between the Metropolitan railway and the Edgware Road (A5). The Rev George Marsh Clibborn was appointed home missioner in 1890, and began services in a milliner’s shop on Palm Sunday 1891. A temporary church was opened later that year, and the present impressive building in 1897. A major fire in 1900 was a setback, but one that was quickly overcome with an enlarged rebuilding that included the distinctive saddleback tower. 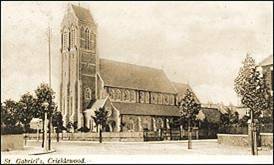 During the Edwardian period St Gabriel’s was a thriving spiritual and social focus for the local community, an achievement that in more recent decades has inspired the renewal of the church with a similar commitment to proclaim Christ in serving the people of Cricklewood and Willesden Green. The untimely death of George Clibborn in a train crash in 1912 began a more challenging period for St Gabriel’s. He is buried beside the church and commemorated by the East window, and by the screen and triptych, the work of the prominent Arts and Crafts designer, John Coates Carter. A further blow was the deaths in the First World War of over a dozen young men who had grown up with the church, some of whom had served in the choir or Sunday School. There appears to have been something of a loss of momentum in the inter-war period and during the long incumbency of William Bulman (1937-71) a failure to adapt to the changing and increasingly diverse character of the parish. In the 1970s St Gabriel’s was threatened with closure but it revived under the ministries of Christopher Gower (Non-stipendiary 1980 – 1984) David Lambert (Priest-in-charge 1984 to 1993), Mark Aldridge (Priest-in-charge 1994-9, Vicar 1999-2004), and then Jane Morris (Vicar 2005- 2019). During Christopher Gower’s time at St Gabriel’s the church saw what could be termed as a revival. The numbers increased significantly and a thriving 18-30s group was formed. This consisted of about 50 regular members and approximately another 30 who came sometimes. Chris talked about relationship with God and spiritual gifts. During this time a midweek service was introduced, and people were encouraged to attend home groups, a real sense of community was developed. David Lambert came to a church that was established and as the church had grown significantly, the stipend was re-introduced. David had been an architect before becoming a vicar and he started to see the potential of the building. He made plans for internal changes, such as a mezzanine floor over the kitchen, which was at the time the vestry. Sadly, he never saw these plans come to fruition. Mark Aldridge carried on building on what both Christopher and David had started. The church started to grow in numbers and he introduced the church to New Wine. He encouraged people to live their faith in their daily lives and encouraged an expectation to see God at work. During this time the church building underwent a transformation with a dais being built at the front of the church, new toilets and meeting rooms and the pews were replaced with chairs. The vision for all this was that the church building would be a place that could be used to bless others. Jane Morris continued the work on our buildings and our ministries. She spearheaded the redevelopment of the church hall and associated flat, such that they are both a source of income to the church now. In the church itself the vision for the building to be a blessing to others has really come to life with our Cafe and Daytime Ministries, Community Night & English classes. New projection, sound and heating has all made the building more functional and welcoming. And our partnership with CAP has enabled us to be a blessing outside the four walls too.